Have you ever wondered how long your Windows PC has been up and running? Here’s a look at a couple way to find out in Windows 10. Nowadays it’s not uncommon to have an always-on PC, whether it is your desktop or a laptop that you don’t travel with. But sometimes if you have had it running for several days, things can start acting wonky. Have you ever wondered how long your PC has been up and running? Here’s a look at how to find out on your Windows 10 system. Note: Previously we showed you how to determine how long your Windows 7 PC has been powered on. The process is essentially the same in Windows 10, but we thought it was worth revisiting since the UI has changed. How Long has Windows 10 Been Running? To find out, right-click the Taskbar and select Task Manager. When it comes up, select the performance tab. At the bottom of the screen, you will see the amount of uptime. In the example below, mine has been running for over six days and counting. 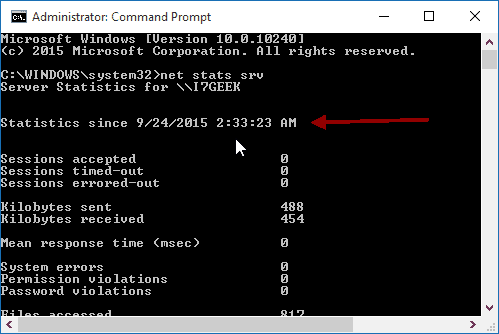 It’s also worth noting that in Windows 10 you can still use the Command Prompt. Right-click the Start button (Windows Key+X) to bring up the hidden quick access menu and select Command Prompt. Then type: net stats srv and hit Enter. 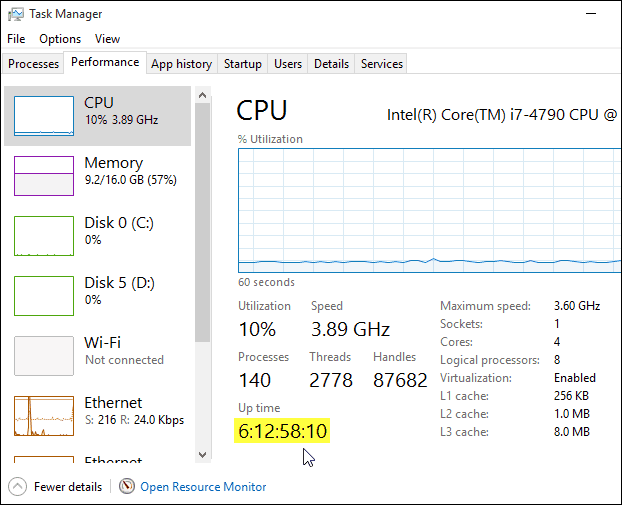 There you’ll see Statistics since which gives you the date and time your system has been up and running. As I mentioned at the beginning of this article, you can do find out how long your computer has been running on previous versions of Windows, too. So the question is: How long has your PC been powered on? If you’re one that never shuts yours off, leave a comment below and let’s see who has the longest up time! And, no, servers don’t count. They are meant to be on 24/7 and rarely rebooted. I am one of the rare people who shuts my PC down everyday when I am done (except when I have a backup scheduled to run overnight). Oddly enough, when I followed the steps mentioned in the article I got almost identical results ( same dates and numbers for except for the “seconds” counter) to the screenshots in the article!!! First off that is weird in and of itself. Second, I had just turned my PC on within the past 15 minutes. We get over a million visitors a month visit us here at groovyPost, I wonder what the odds are? Seriously though, keep up all of the great work. This is a excellent resource. instead of any stats in cmd, and the task manager has no uptime section in processes… is there something wrong with my machine? 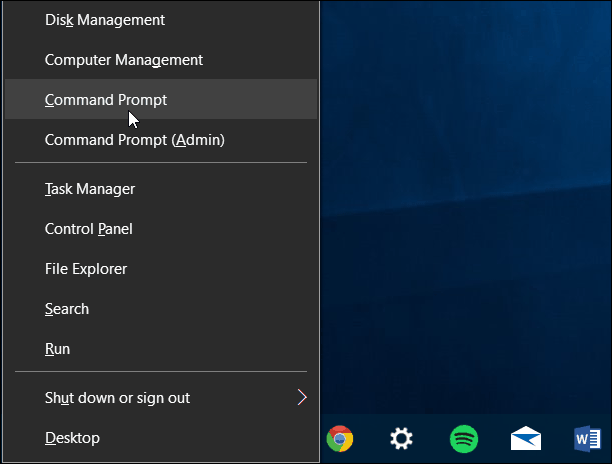 The command indeed has been changed by Microsoft in later builds of Windows 10. It is the workstation stats you want to view, as should be more correct when on standard Windows (Home, Pro, Enterprise) OS instead of Server OS.